Need a headstart on Christmas lunch? This year my family will be served duck confit, a French classic that can be prepared weeks ahead and finished off on the day of serving. Confit is cured overnight in a salt/spice blend, then slow-cooked in duck fat for several hours. You then put the cooked portions into a container and cover them completely with the same duck fat and store, covered, in the fridge for up to a month. When time comes to serve, you crisp the skin in a frypan and quickly finish the duck in a hot oven; that process takes only around 30 minutes. You can then serve it with a sauce of your choice which can also be made ahead of time. Crush juniper berries, salt and coriander seeds using a mortar and pestle or grind in a spice grinder. 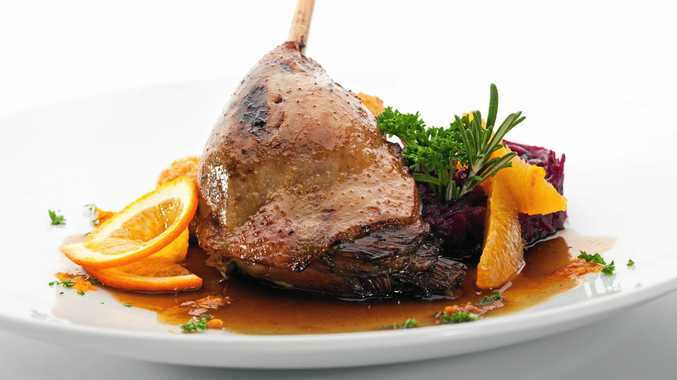 Dry duck pieces with paper towel and rub with salt mixture; place in a glass or ceramic dish and cover with foil. Refrigerate overnight. Preheat oven to 130C. Briefly rinse salt mixture from duck under the tap and pat dry. Place in an enamelled cast-iron pot or casserole dish with the bay leaves and peppercorns. Add duck fat to cover and cook for 3 1/2 hours (for Marylands) or 3 hours (for legs). Carefully remove duck from the fat and place in a container with an airtight lid. Cover with the fat and seal; refrigerate for up to four weeks. To serve: Preheat oven to 220C. Remove duck from the fat, scraping away as much as possible. Heat a heavy frypan over high heat and cook duck pieces, skin side down, for 5 minutes, then transfer to the oven for 25 minutes or until golden and crisp. Serve immediately with a sauce of your choice.